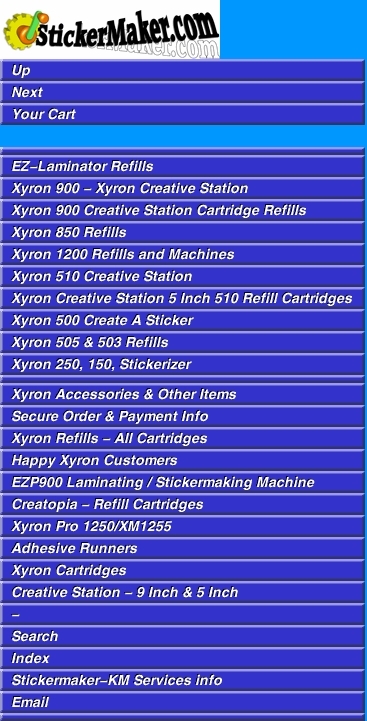 Xyron machines and refill cartridges of all types! Genuine Xyron laminator machines & Original Xyron Refills is what we specialize in for twenty years, and our warehouse is ready to fill your order! Creative Station 9 inch and 5 inch, Xyron 900 - Xyron 1200, Pro1250, 2500, Xyron 250 & 500 Create-a-Sticker and Max. We even have refills for the original Xyron 850 Laminator/Stickermaker! Creative Station 9 Inch / 5 Inch - BRAND NEW DESIGN! Brand New Creative Station! Uses both 9 inch AND 5 inch cartridges!! Permanent adhesive cartridge refill. Fits Xyron 900 and nine inch Creative Station Machines. Great for scrapbookers and card makers. Applies high tack permanent acid free adhesive. 9 inch Creative Station Laminate Refill. 2 side encapsulating laminate.